Hot sunny day can make your car feel like an oven on four wheels, especially when you’re just getting into it after it has been parked under the sun for a while. Jumia Travel, the leading online travel agency shares 7 ways to help you deal with a hot car. This is an obvious one, nevertheless it’s best to mention it. Try to avoid parking in direct sunlight. Even if you can’t find shaded parking, try parking in place where the concentration of the sun’s hot rays isn’t so intense. You can also open your windows to a width of person’s arms so no one’s arms can get into your car in your absence. You can purchase window vent visors and get them attached to the top of your car’s window. These help to mask the fact that car window is open because of how hard it is to see through them. This is especially useful when you can’t find a shaded parking spot for your car. Purchasing a sun shade or heat shield is a great investment to spare yourself the discomfort of those hot sunny days. They help to reduce inner temperatures and the sun shades help to protect the car’s interior from harmful sun rays that penetrate windshields. This helps to ensure that the side you touch is away from direct sunlight so the heat doesn’t burn your palm when you re-enter the car to drive. While in the car you can also wipe the steering briefly with a damp cloth to cool it down further, or simply wait for it to cool down before touching it. Avoid immediately entering into a car that has been parked in direct sunlight. If you are in a secure place, open all doors for like 30 to 60 seconds before entering the car. If you can’t open all doors, just open only your door. This helps to get most of the hot air out of the car before entering. Leaving the windows slightly open while parked also helps to reduce the heat trapped in the car while it’s parked. This is especially important if you are unable to roll your windows slightly down before leaving the car. Roll your windows down and turn the A/C up for a few minutes to let the hot air out. Most times when we enter a hot vehicle we are quick to turn on the A/C immediately, concentrating mainly on the upper vents which we direct to our body. A more effective method will be to turn on the floor vents first when using the A/C, to push the hot air out. This is because heat rises and the quickest method to cool a car is to push the hot air out from the bottom to the top, so stale hot air can easily escape through the open windows. Once the hot air is out, you can switch to the upper vents and turn the A/C down. If your car has air conditioning, be sure to set it to ‘fresh air’ rather than ‘recirculation’ when you first turn it on in a hot car. This is because recirculation typically draws from interior air and really only works best when your car is already at a desired temperature rather than when it’s oppressively hot. With ‘fresh air’ the hot stale air is taken out to bring in fresh and relatively cooler air. 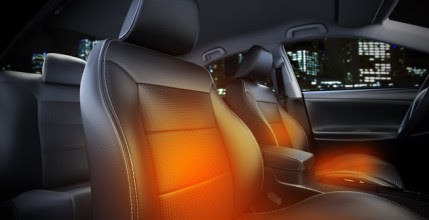 Your A/C setting can be returned to recirculation 5 to 10 minutes after or when desired temperature is reached, to avoid carbon monoxide emission from other cars being pulled into your car.